Concept Development by Lisa Liljenberg creating an expansion idea for the classic FPS game Counter Strike aiming to create a gender neutral and including concept. Final design project at Berghs School of Communication based on personal interests and reflections of the gaming industry. My goal was to create a game concept with an interesting and imaginative storline, genderless characters and a non-human enemy you can relate to. If produced, this game could attract more female and non-binary players to play CS (something it does not have today, research shows fewer than 4-7%) and thereby influence into a more inclusive community and e-sports arena. The concept "AI Destruction" takes place in the year 2220, where AI has taken over the world and mankind lives in oppression. After decades, they have now developed weapons and formed troops ready to fight the AI to regain their freedom. The global market of video games is constantly growing and so is the number of female gamers. I started researching gaming motivation and found that female gamers enjoy games of "Action" and "Destruction" but prefer when there's also a level of "Fantasy" and "Story" involved. When it comes to FPS games (First Person Shooting) only 7% of the gamers are female. This was a huge trigger for me and I started to wonder: WHY? A classic game in need of an update. Ruling the FPS scene since 1999. Last update (CS-GO) came in 2012. Hostile community. 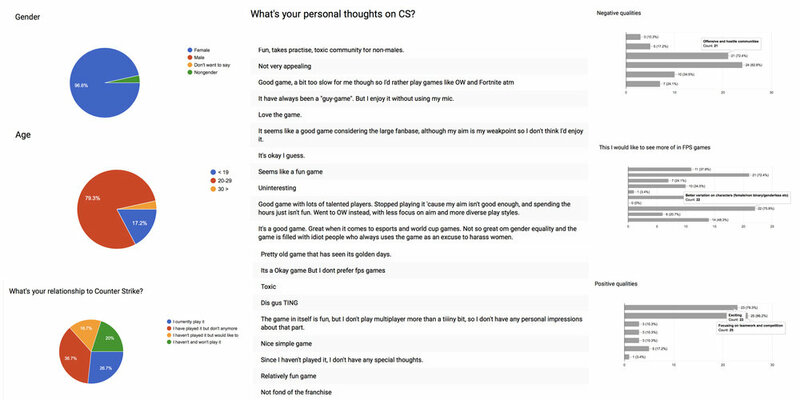 Research and forums told me that female gamers avoid CS because of its community. Men only. The majority of players are men and also the characters you play are men. E-sport. 400'000 Swedes are daily following/watching e-sport, making it the second largest sport in Sweden after football. No story. Established gameplay. Teamwork and skills are prioritised. A story could get the action even more interesting to play – and watch. Survey results from the Facebook Community "Female Legends". First draft of the winning concept "Destruction of AI"
With my concept starting to take form I wanted help from the best – so I contacted Swedish game developer DICE to get feedback on my idea and get guidance and advice about how to get into the process of game design/development. FUTURISTIC (But NOT Sci-Fi. Avoiding space-ship shapes and turquoise/purple/silver. Aiming towards straight lines and "new" materials. The Underground. Cold, dark, hostile, empty. This is where the humans live and for centuries has developed new weapons to destroy the AI's. The Market. Inside arena, endless passages, electric light. This is where the humans work to provide fashion and "surgery" for the AI's who are inspired by the human appearance. Human Rebels. A genderless and androgynous character with a dramatic appearance with elements of technology – keeping a human realism by choice of materials and clothing. AI's. Inspired by the human appearance and our fashion with a clear touch of machinery and dark attributes. I had a vision about creating unique characters for this game and therefore I got help from the talented illustrator Malin Forsberg Kåre who also helped out with the new logo character. I'm so happy about this project and how it all turned out! I'm both satisfied and proud over the result and for how much I accomplished over these six weeks. The attention, feedback, comments, time, participation, engagement and encouragement I have got from both people in the business, teachers, friends and comments online has been such a boost to keep working hard. Let's see what comes next! My finas destination was to .visualise my concept and my characters in a mood film/trailer. In front of the green screen and the camera is the talented actress Johanna Löwenborg. Design and styling by myself as well as filming and editing. A big thanks to Mitch Martinez - CineStock who has shot the particles and smoke and shared for free downloads with I have used in this video for effects.